Fantastic 3-bedroom home on Hogtown Bayou at Cessna Landing! This home backs up to protected wetlands offering privacy and a tranquil setting. Capture incredible views of the bayou and amazing sunsets from the open deck, screened-in porch or backyard. Just a few doors down is a community dock which is the perfect place to launch a kayak or paddle board and enjoy the coastal lifestyle you desire! 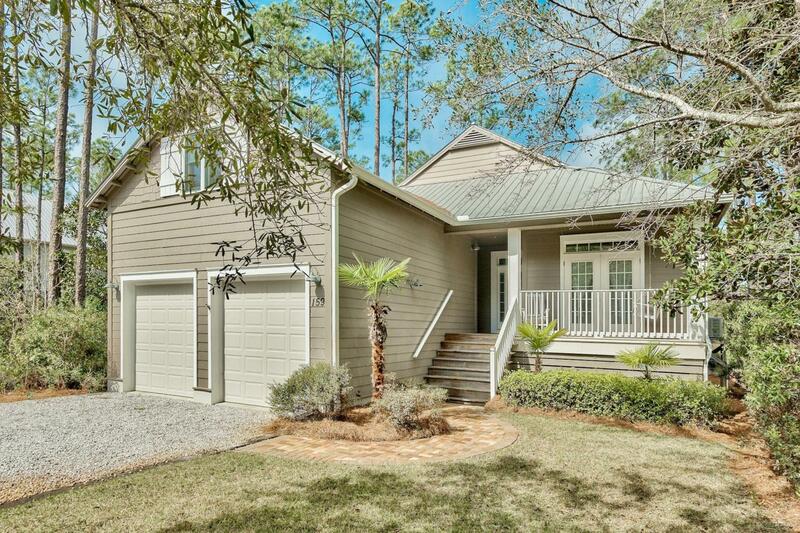 This is a classic ''Florida cottage'' with hardie board exterior & a metal roof. There is a detached 2-car garage with a breezeway & huge attic above that could easily be finished out or a great art or workspace. This home boasts many luxurious amenities that set it apart. The open floor plan features tile floors & recessed lighting surrounded by countless windows to enjoy the natural surroundings!Craftsman window and door frames with transom windows give this home a unique style. The dining area features a tray ceiling, and the breakfast bar and breakfast nook offer more casual dining options. The updated kitchen features ample granite counter space, a breakfast bar, added mosaic tile backsplash and stainless steel appliances. The smooth top stove is accented by a stylish range hood. A breakfast nook provides a wonderful spot to enjoy meals or morning coffee surrounded by tranquil views of the bayou. From the living area you can step onto the large enclosed porch to further enjoy the views. In addition, there is an equally spacious open deck just beyond that, which offers entry into the master bedroom. The enormous master bedroom offers peaceful views of the wetlands and the bayou, and includes direct access to the deck. The master has a great en-suite bathroom with dual vanities, soaking tub, walk-in shower and walk-in closet. The front bedroom features a door with window transom that opens onto the front porch, to maximize the enjoyment of the fresh air. A full bath with tile floor and oversized vanity sits between the two guest bedrooms. There are two additional linen closets for extra storage. The HVAC is less than 2 years old and under warranty and the home has recently been repainted both on the exterior and interior. There is an irrigation system and even clever pest control built into the interior walls. This home has been well thought out! The two car garage is detached and spacious. It is outfitted with an extra refrigerator that conveys, and above the garage is a large attic with great potential as extra storage or to be finished off as an additional room, art studio or workspace. There is a breezeway between the garage and home, with an additional entrance to the home via a mudroom and pantry connecting to the kitchen. This home is nestled on over 1/4 acre lot and offers a beautiful natural setting. With the wetlands out back, the lot feels even more expansive. For additional privacy, the vacant lot to the left (west) of this home is available for purchase from this seller as well! Excellent opportunity to ensure privacy, expand the yard, or build an additional home or carriage home. This gated community features a beautiful community pool just a few steps from your door. The large sundeck is perfect for relaxing, and even offers a covered portion when you want to get out of the sun. Just behind the pool is a community dock, perfect for fishing or launching a paddle board or kayak water adventures. Hogtown Bayou connects to beautiful Choctawhatchee Bay so there is plenty of waterways to enjoy and explore. Cessna Landing is located in the heart of Santa Rosa Beach, just a short distance from the Cessna Landing Park and boat launch. Just minutes away from Sacred Heart Hospital, and the shopping and dining available at Grand Boulevard and Baytowne Wharf. Being off of N Highway 393 you are also close to the beautiful beaches of South Walton and the legendary 30-A area, a famous recreational gem on the Emerald Coast. Don't miss the opportunity to own this amazing waterside home in a very quiet and private community!